Christmas is rapidly approaching, which means a lot of treats and desserts are in your future! Rosanna Pansino, author of BAKING ALL YEAR ROUND, shares her reindeer cake recipe. ’Tis the season! This is the kind of cake that brings back so many wonderful memories of spending Christmas with my family. During the holidays, I used to dress up as Santa and my sister would be a reindeer. To this day, we still laugh about how we used to run around the house pretending to deliver presents. A traditional spice cake is a welcome addition to any festive feast or holiday party. Not only is this recipe delicious, it’s also super cute. Work with fondant on wax paper sprinkled with powdered sugar. For the antlers, roll out the brown fondant to 1/8 inch thick. Cut out 2 antlers using the template A . For the ears, roll out the dark brown and cream fondant to 1/8 inch thick. Use the teardrop cookie cutters to cut 2 large dark brown outer ears and 2 small cream inner ears. Using water, attach the small teardrops to the large teardrops B . For the eyes, roll out the black fondant to 1/4 inch thick. Cut out 2 eyes using the template. Roll 2 small balls of white fondant for the eye reflection and attach to the eyes. For the holly, roll out the green fondant to 1/4 inch thick. Cut out holly leaves using the template. Use a fondant tool or toothpick to make leaf details C . Roll 1/4-inch balls of red fondant for the holly berries. Set aside to harden for about 24 hours. Once dry, the antlers should stand upright without bending. Preheat the oven to 350ºF. Grease three 6-inch round cake pans and line the bottoms with rounds of parchment paper. In a medium bowl, whisk together the cake flour, all-purpose flour, baking powder, baking soda, salt, cinnamon, cloves, ginger, and nutmeg. In a large bowl, with an electric mixer, beat the butter, brown sugar, granulated sugar, and honey until light and fluffy, 3 to 5 minutes. On low speed, alternate adding the flour mixture and the buttermilk to the butter mixture, beginning and ending with the flour mixture. Divide the batter evenly among the prepared pans and bake until a wooden pick inserted into the center comes out clean, 40 to 42 minutes. Let cool in the pans for 15 minutes, then turn out onto a wire rack to cool completely. Level off the tops with a cake leveler or a large serrated knife to create three 2-inch cake layers. Make the Swiss Buttercream Frosting. Tint half the frosting light brown. Stack the cake layers on top of one another with a thin layer of light brown frosting in between the layers. Frost the entire cake with light brown frosting. Divide the remaining frosting among 3 bowls D : Bowl 1: Tint light brown and scoop into a decorating bag fitted with a #824 tip. Bowl 2: Tint dark brown and scoop into separate decorating bags fitted with a #824 tip and a #4B tip. Bowl 3: Leave untinted and scoop into a decorating bag fitted with a #2A tip. Pipe the frostings on top of the cake for decoration. 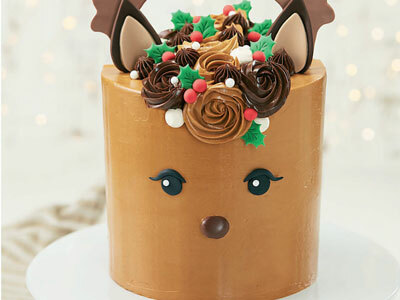 Place the fondant decorations on the cake: antlers, ears, eyes, and holly. Place the Milk Dud on for the nose. Find recipes for every holiday with BAKING ALL YEAR ROUND by Rosanna Pansino! Excerpted from Baking All Year Round by Rosanna Pansino. Copyright © 2018 by the author. Used by permission of the publisher. All rights reserved. 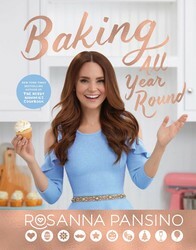 Rosanna Pansino, award-winning YouTube star, baker, entrepreneur, author, and proud dog mom returns with Baking All Year Round, the highly anticipated follow-up to her New York Times bestseller The Nerdy Nummies Cookbook.Baking All Year Round is filled with creative and delicious recipes for celebrating with friends and family throughout the year. There are eighty-six recipes covering holidays and special occasions such as Valentine’s Day, Mother’s Day, Father’s Day, Halloween, Christmas, birthdays, weddings, and more. Recipes include sweet treats like Blackberry Cobbler, Donut Cake, Confetti Pancakes, and BBQ Grill Brownie Cupcakes to savory dishes such as Heart Shaped Ravioli, Baseball Pizza, and cheesy garlic Breadstick Bones. Included in this book are several vegan, gluten free, or dairy free options. It’s the perfect cookbook for families to make fun food together and create lasting memories. Whether you’re celebrating at home or going to a party, Rosanna’s innovative ideas are sure to delight and entertain.